Charlie Bower is a director in BowerGroupAsia’s Washington office. He oversees the development and execution of traditional advisory and digital strategies to help BGA’s clients meet their goals. He also plays a key role on the BGA USA team, assisting clients from around Asia with developing strategies to accelerate investment growth, manage risk, and engage key stakeholders in the United States. 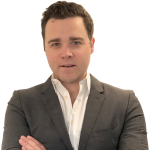 Charlie is concurrently a vice president of AkarAsia, BGA’s sister company, providing digital intelligence, engagement and activation services to clients across both Asian and US markets. Prior to co-founding AkarAsia and joining BGA, Charlie was the manager for government and public affairs for North America at Wipro, a leading India-based information technology services provider. He helped build the company’s regional government affairs function and assisted in developing and implementing the company’s government engagement strategy at both state and federal levels in the US and Canada He also assisted in creating and driving the company’s corporate social responsibility programs, a key element of the company’s national narratives. Before joining Wipro, Charlie was a research associate for South Asia at BGA, where he tracked and analyzed political and economic trends in India, Bangladesh, Nepal, Pakistan and Sri Lanka. Charlie earned his bachelor’s degree with honors in history and political science from the University of Colorado at Boulder.